When I trailered the 56 home I lost a part that I cannot find online. Follow me. Taillight wiring harness from fuse box connects to taillight pigtail harness. 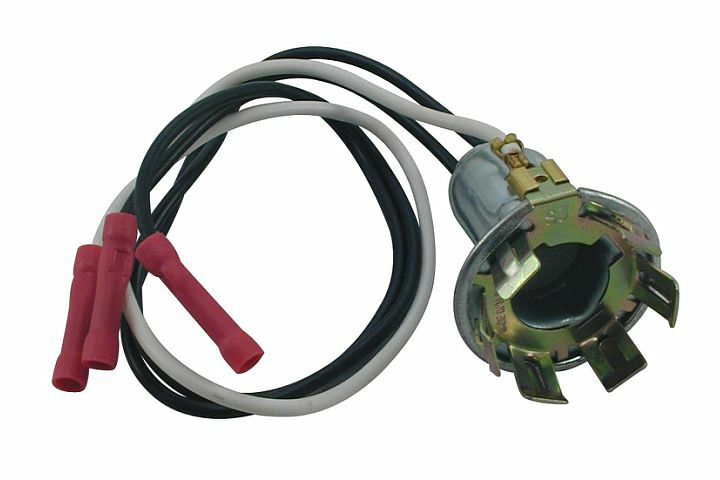 This pigtail harness terminates with a two prong female connector, where the unnamed part has two male connectors and the other end receives the stop light bulb. I can easily locate the pigtail harness and bulb but not the taillight bulb socket . What would you call this part so I can improve my online search? Stupid question, but I am having no luck finding it, will call part house tomorrow. The bulb contacts originally were wired directly to the rear harness with no connectors. The termination of the tail/stop wire went into the bulb socket. That socket is part of the tail light assembly. The socket is crimped into the pot metal housing to provide a solid ground contact to the housing and the body. If that is missing, you may be able to use a metal socket, by drilling the hole in the housing to the correct size, and splice the wires. Edited by acardon on 12-12-18 08:31 AM. Reason for edit: No reason given. Thanks, went to ecklers and danchuck with no joy. Will superchevy it. I'm not sure what you need. It doesn't sound like you have the original wiring. This goes in the tail light bulb socket and is the contacts for the bulb. It was originally wired directly on the end of the tail/stop light wires. Link to pigtail.